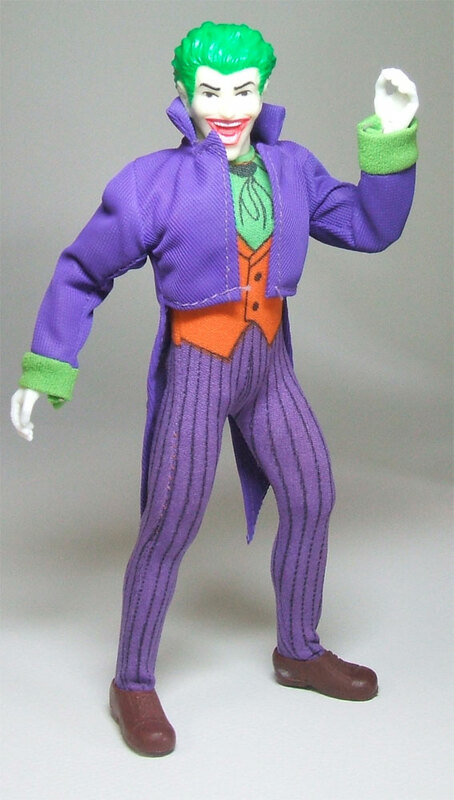 As I reviewed older Superman figures for my Captain Toy Picks...Top Ten Superman action figures last week, I realized there were a ton of terrific Joker figures out there, ripe for a list all their own. He's a character that's had a lot of different looks in a lot of different formats and scales, and picking out my ten favorites was no easy task. As always, the first photo up there is NOT one of the ten. Why would I spoil the point of the article with a photo of one of the finalists? I do always use a photo of a contender though, and that's the Injustice Joker from the DC Multiverse series from Mattel who almost made the final cut. Yep, another Mego on another list. Hey, they did some of the coolest superhero figures - and Trek, and POTA, etc. - and were the gold standard for many years. While they might look silly and goofy now, they were a ton of fun for kids in the 70's. 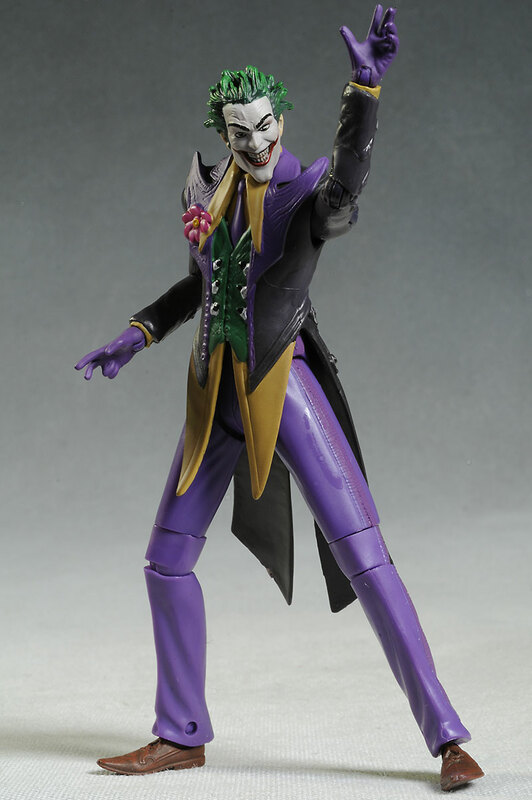 The Joker is probably my favorite in their entire DC line, thanks to the printed suit. It was a smart short cut to creating the complete look with a single layer, particularly with a children's toy. As I said before, if you're looking for any info on anything Mego or Mego-like, head over the the Mego Museum. I snagged the below photo from them. Lots of different artists and writers have had lots of different takes on this classic Batman villain. Jim Lee's designs for the Batman: Hush comic series are fan favorites, and DC Direct did a nice job translating them to toys. The Batman is perhaps the best of the bunch, but the Joker deserves some serious props as well, and it's truly a unique take on his look. 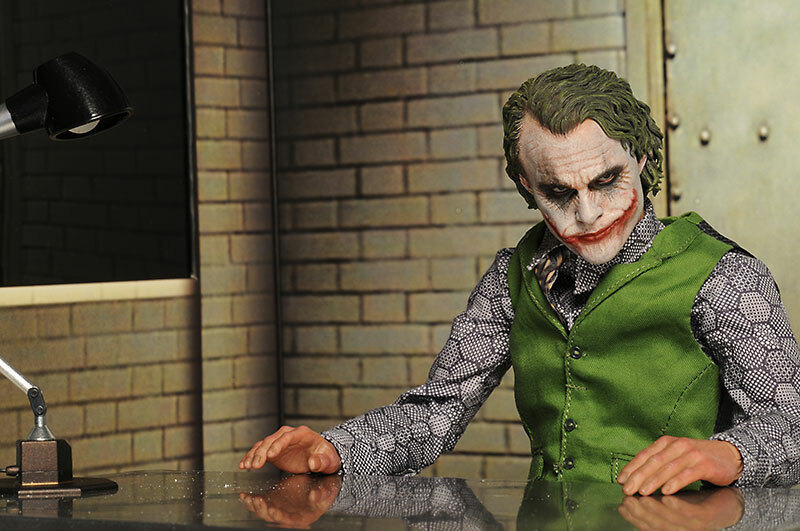 Hot Toys isn't the only company that can make a great sixth scale Joker. A few years ago, Sideshow did their comic based version, and he remains one of my favorites. With two unique head sculpts and a ton of cool accessories, he's one of their better releases in general over the last few years. 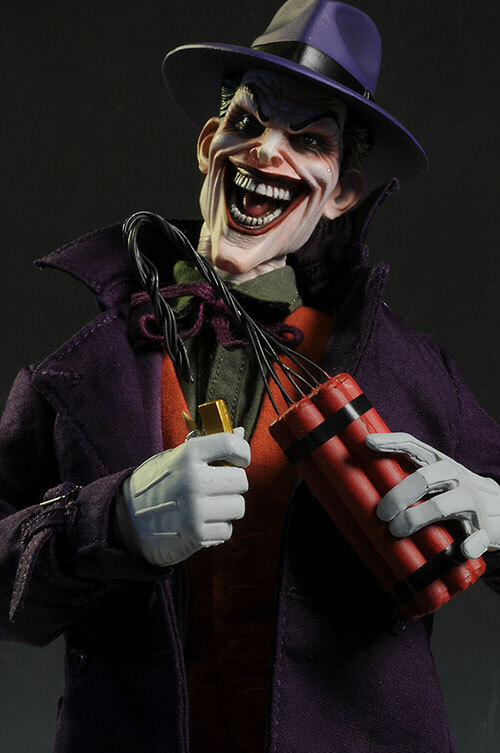 DC Direct - now known as DC Collectibles - has produced a ton of Joker figures in the 7" range. One of the things that sets them apart is the variety of many of the figures, based on a wide range of comic series and artist styles. 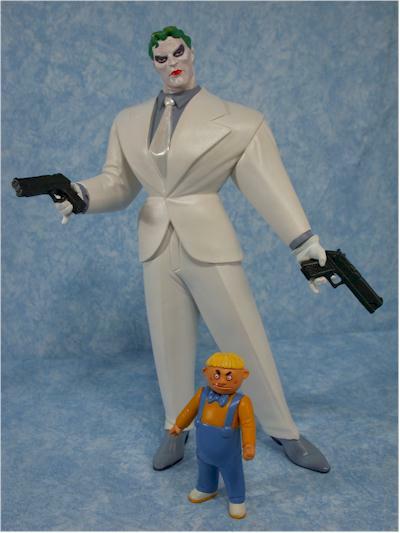 One of my favorites for his truly maniacal appearance is the Batman and Son release. This is based on Andy Kubert's art from the story line of the same name, and I love the detail and design. The Kubert Batman from this series was terrific as well, and together they pack a punch on the shelf. We've gotten a ton of DKR Batmen. We've gotten a few Supermen. We've even gotten a couple Robins. But the Joker, with his distinctive look, has been woefully ignored. Except, that is, with DC Direct's series released a dozen years ago. Perhaps we'll see a Mezco One:12 Collective release, or a Multiverse release, but until then, this guy is a favorite. With every character, there's always one go-to version, a basic rendition that captures the non-specific look perfectly for you. 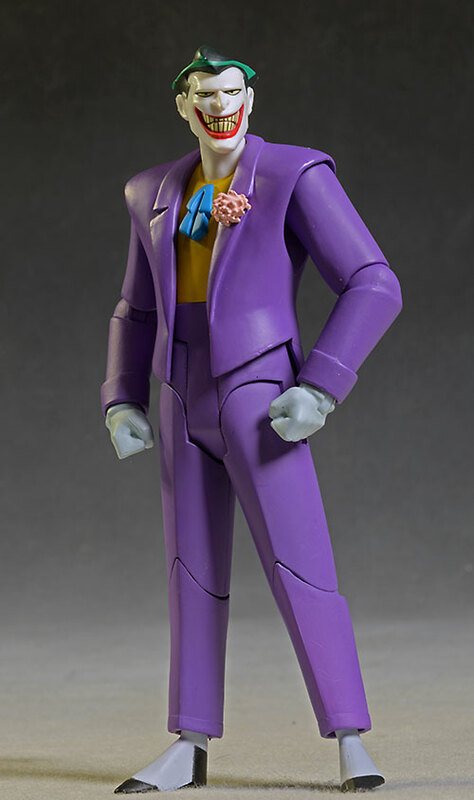 A figure that isn't based on a specific actor, but rather the more general comic book look and feel, perhaps based on a favorite artist...perhaps not. 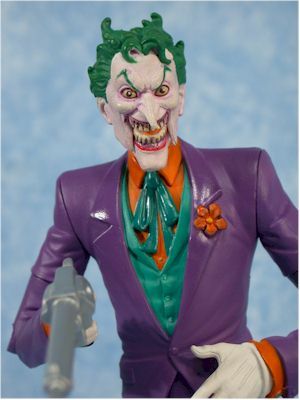 When it comes to the Joker, my go-to is the DC Universe Classics wave 10 version, with a terrific head sculpt, excellent accessories, and the usual great DCUC articulation. This is the first of two Ledgers on my list. 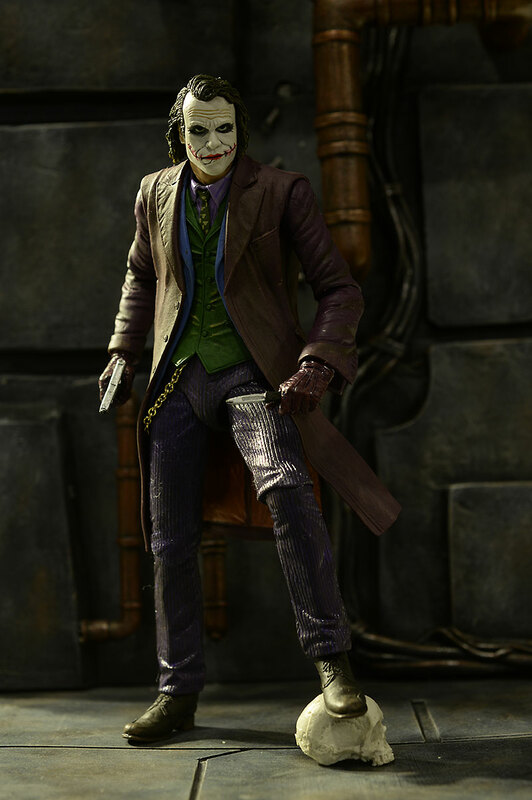 Hot Toys did this Joker character roughly 7832 times, and most of those are very good to great. But it's this '2.0' version, done in the old DX style with PERS eyeballs and a ton of extras, that's my favorite of the bunch. Like any sane, rational Batman fan, I realize that Batman: The Animated Series was the finest telling of the Bat-verse ever to grace the screen. A lot of that has to do with their characterization of the Joker, and the fantastic voice work by Mark Hamill. Kenner and Hasbro did their best back in the day in producing animated figures, but DC Collectibles has really gone above and beyond in capturing the true animated look in a fantastic action figure. Their Joker is easily one of my favorites. It's hard not to have more than one Heath Ledger version on the list, and his portrayal of the Clown Prince remains my favorite. NECA produced this terrific 7" version last year, and it was a highlight of their DC themed series for me. Great articulation and a fantastic sculpt shows you just how great NECA can be when they're at their best. My very first Captain Toys Picks... list was of the Top Ten Sixth Scale Figures. 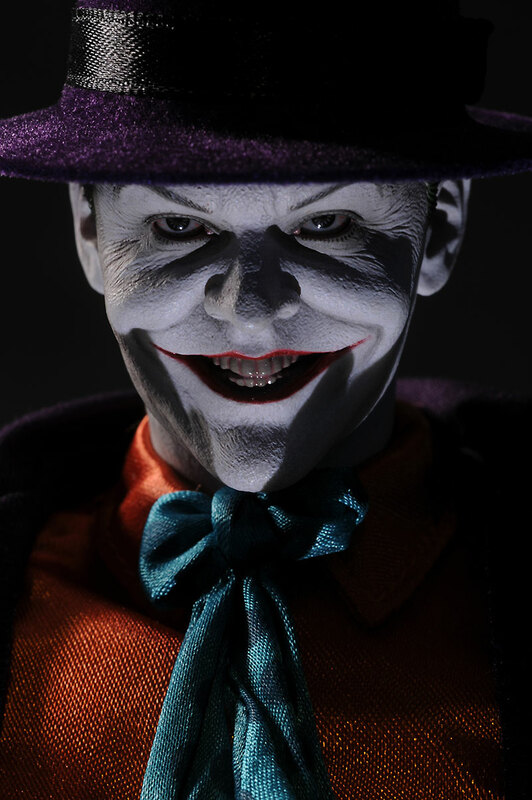 If the Nicholson Joker took that honor, odds were pretty good he was going to be the best Joker figure as well. Don't forget the Mime version though - there are some features that make him stand out from this first release. 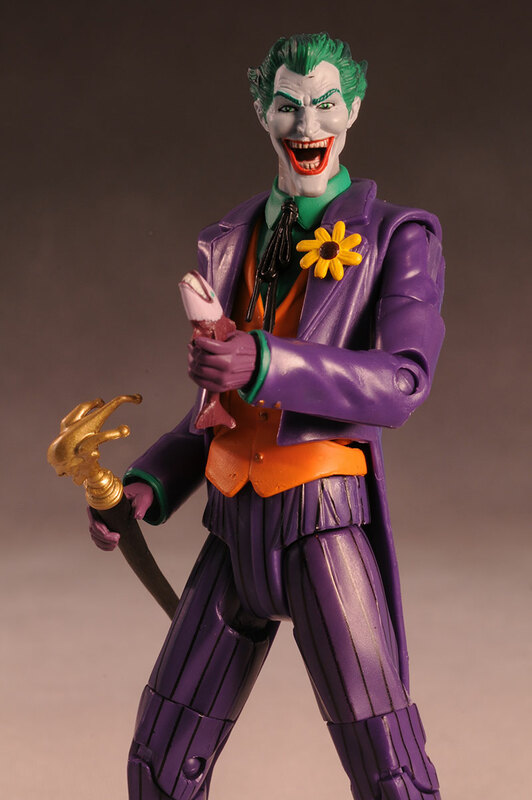 If we get the teased Romero Joker, and the detail and quality are as good as the Nicholson version, I will have a new number one. Until then, it's going to be hard to topple this guy from his perch. 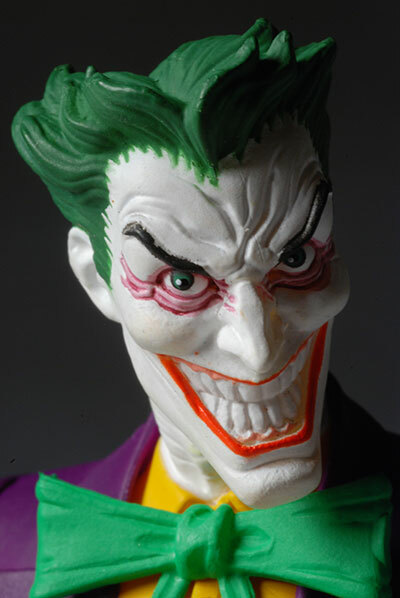 There were a lot of great Joker's that almost made the list, including the Enterbay quarter scale Masterpiece Dark Knight version, DC Direct's Secret Files Unmasked, Super Powers Joker, and even the recent Icons version. I have no doubt you'll have others to add to the list, considering how many have been produced over the years.